Sophomore Bo Babich rushed for a career-high 141 yards and a touchdown in Saturday’s 17–16 loss at UW–Whitewater. Babich was named the Pioneers’ Offensive Player of the Game. POSTED November 9, 2017 11:41 a.m.
WHITEWATER — In the annual George Chryst Memorial Game Saturday, UW–Whitewater edged visiting UW–Platteville 17–16. Both teams are now 6–3 overall, with the Warhawks improving to 5–1 in the Wisconsin Intercollegiate Athletic Conference and the Pioneers falling to 3–3. The Pioneers came into the contest ranked 20th in the D3football.com poll, and the Warhawks received votes in the weekly rankings. The annual game is played in memory of the late George Chryst, who led the Pioneers to a 79–60–2 record before his sudden death in 1992. After a scoreless first half, the teams combined for 31 of the game’s 33 points in the third quarter. The Warhawks one up 17–0 on a Drew Patterson 64-yard run, a five-yard pass from running back Josh Ringelberg to Tony Gumina and a Wojciech Gasienica 25-yard field goal. The Pioneers answered with two third-period touchdowns, a 41-yard pass from Jack Eddy to Mark Johnson and a Bo Babich one-yard run. 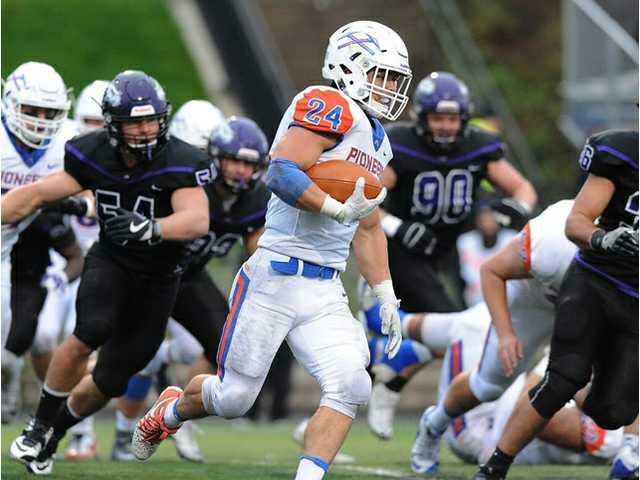 The Pioneers fought back within a point with 2:43 to play in the game, when Ben Mogilevsky tackled a Warhawk in the end zone for a four-yard loss and a safety. After the free kick, the Pioneers got the ball back near mid-field but could not convert a fourth-down attempt with 1:14 to play. The Warhawks were then able to run out the clock. As is the tradition with the George Chryst game, the media vote offensive and defensive players of the game for each team, and those players are saluted at midfield post-game. For the Pioneers, Babich was voted the offensive player of the game after rushing for 141 yards, and Chandler Crary was the defensive honoree after making seven tackles, including a sack. The Warhawks’ Patterson, who gained 110 yards on the ground, and Nate Tranel, who had nine tackles, earned honors for their team. The Pioneers close their season Saturday against UW–Stevens Point. The 2017 seniors will be saluted prior to the 2 p.m. kickoff. First downs — P 22, W 10. Rushing — P 45-138, W 34-107. Passing (comp-att-int, yds) — P 25-33-1, 201, W 13-26-0, 172. Fumbles–lost — P 3-2, W 0-0. Penalties-yards — P 6-39, W 10-115. Rushing — P: Bo Babich 30-141. W: Drew Patterson 18-110. Passing — P: Jack Eddy 15-19-1, 153, Cade Earl 10-14-0, 48. W: Cole Wilber 12-25-0, 167. Receiving — P: Mark Johnson 7-94. W: Adam Korpela 2-58. Tackles — P: Chandler Clary 7, Jacob Forney 7, Dakota Tomkins 6. W: Nate Tranel 9, Jacob Erbs 8, Alex Zacharias 8.